Tucked away in the Northern part of Delhi is a colony that attracts a determined set of youth from across India. The aim is to study and prepare, the target: to crack the prestigious Civil Services examination conducted by the Union Public Service Commission (UPSC) in the middle of May each year. 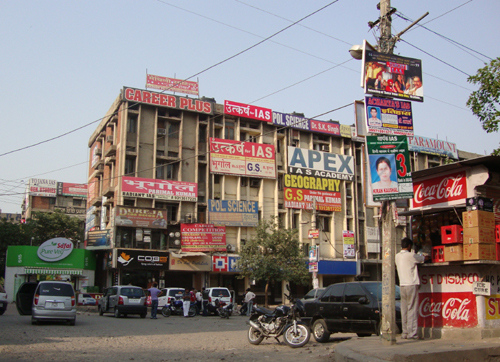 This very resourceful Dr. Mukherjee Nagar colony has it all for that–rooms and hostels to stay, well over 300 IAS coaching centers, food courts of all kinds, book stores and what not. The proximity of the University of Delhi has only helped in turning this place into a student hub and perhaps the reason why this locality got chosen to be the one point stop for civil services preparation. Such is the situation today that the economy of this colony would perhaps collapse if all the students are removed in one go. Yesterday, was the big day here! Yesterday was when the civil services preliminary test was conducted in centers across Delhi (and India). And yesterday was when–in the morning hours–one could see a majority of the youth here on the street, walking to the nearest bus stand or the Metro station. This has become an annual affair and more and more candidates have been applying each year. For the struggle to make it to the corridors of power attracts so many, it only adds to the already existing community! But fewer make it through the entrance and even fewer clear the interview to be able to join any of the IAS or the allied service academies. And amidst all that, Mukherjee Nagar only gains more popularity and an increasing number of student influx.